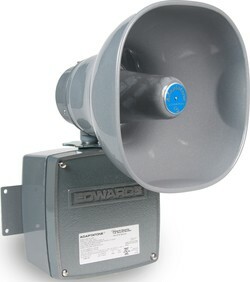 The Edwards 5530M Adaptatone Millennium is a heavy-duty industrial, tone-selectable, signaling device capable of producing volume-controlled, high-decibel tones. It uses a microprocessor circuit to create 55 distinctive tones, selected by setting a dip switch within the unit. For a complete listing of all 55 tones, see Tone Selection under Catalog Pages on the left hand side of this page. The Adaptatone Millennium can be activated from field-wired, normally open contacts, or from a 24VDC or 120VAC external voltage source such as an output of a PLC. PLC compatibility assures no additional loading resistors or relays are required to set up your Adaptatone. Selected models are designed to serially connect to RS485 networks. The 5530MV-485Y6 additionally has a field recordable voice feature that allows activation of voice messages over the RS485 network. See connectivity and Activation section for more detail. Normally open contacts can be obtained from the Cat. No. 5538-4 and/or Cat. No. 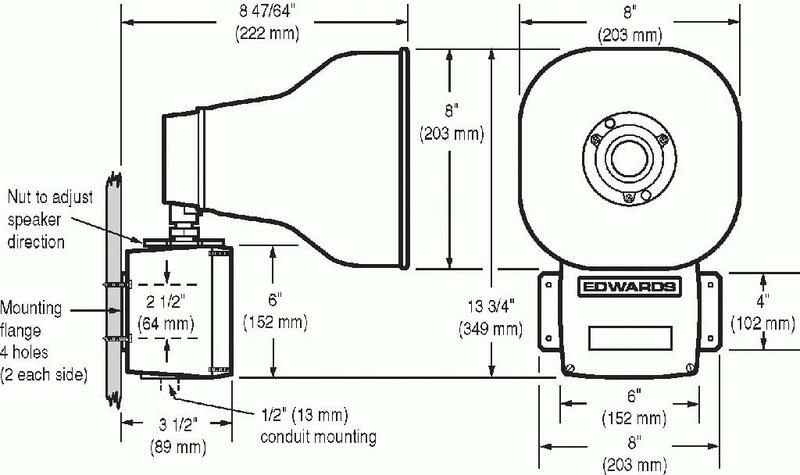 5538-4R Adaptatone Signal Actuators. Designed for industrial applications requiring high decibel output and microprocessor reliability. Typical applications include emergency warning systems, plant evacuation and security intrusion alarms, process monitoring, shift start-and-dismissal horns, and paging signals. ½" (13mm) conduit or surface mounting. See Adaptatone Signaling Installation found under Catalog Pages on the left hand side of this page.